The esteemed chef doesn't break much new ground at this casual spot in the old Albany Park police station. Nick Murway The most interesting offerings at Taste of Thai Town aren't on the regular menu at all. Nick Murway The khao kha mu might be the most soulful thing on the menu. Nick Murway The clear seafood soup po tak is remarkably good. 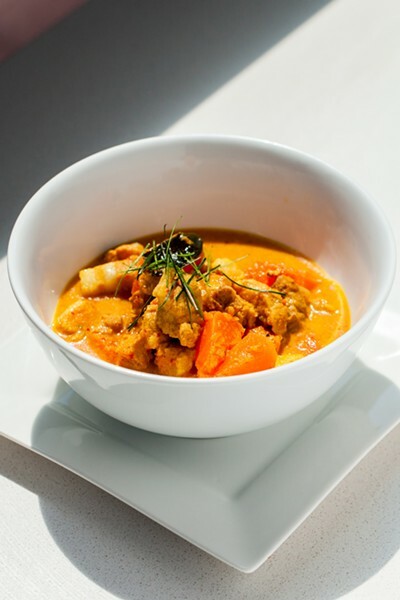 Nick Murway The pork curry kabocha is spiked with lemongrass and turmeric. Nick Murway It only takes a second to gobble up the miniature pot stickers. Nick Murway Som tam, a papaya salad, has sweet, salty, and sour elements. 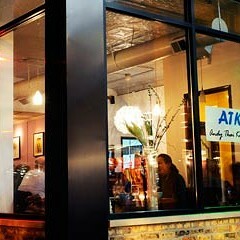 At Taste of Thai Town you can eat khao kha mu in what was once a holding cell. You can slurp tom kha gai in booking. And you can spoon up green curry and rice in a basement that once might've been reserved for cattle prodding and water boarding. Arun Sampanthavivat's long-awaited second restaurant is a strange but karmically satisfying repurposing of the old Albany Park police station. Some two years in the making, it was billed as sort of a community center for Thai culture and an Eataly for Thai cuisine. So far much of that vision remains unrealized, but the restaurant is in full swing. Meanwhile, Sampanthavivat's eponymous 30-year-old Irving Park fine-dining restaurant Arun's has not aged well. Thaiphiles learned long ago that the most interesting food in town can be found at any one of a half-dozen mom-and-pop storefronts for prices far lower than his $100 prix fixe menu. 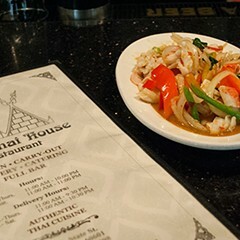 Taste of Thai Town approaches the price point of those humbler spots; the question is whether it can match their relevance or depth of soul. 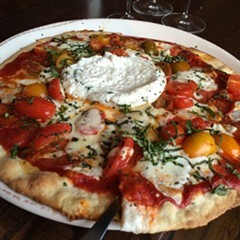 The answer begins to reveal itself with just a glance at the menu. 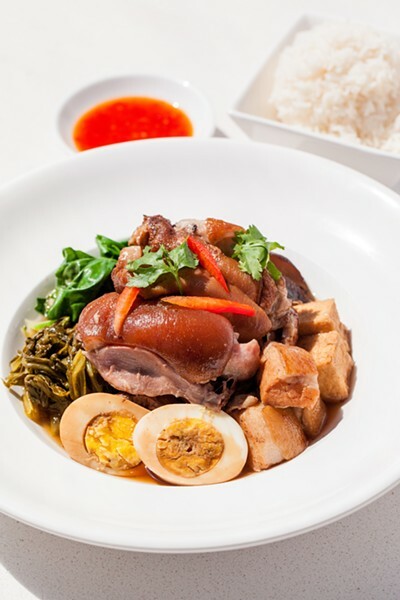 Sampanthavivat recently told Channel Seven that he'd be featuring dishes like jungle and southern sour curries that allegedly can't be found in any other Thai restaurant. He must not get out very much. These curries, which aren't even being served here, can be found in plenty of restaurants around town, as can most of the other dishes on the menu. Does Sampanthavivat, via chef de cuisine Joe Sukjam, execute them any better, though? The results are mixed. The food I ate during repeat visits to ToTT was so inconsistent I began to feel like I was eating in different restaurant each time. "Fiery" chicken wings smothered in a tame, chunky chile paste and piled upon a crispy fried sweet potato nest were so rubbery I suspected they'd been boiled. The familiar chicken soup tom kha gai, marked on the menu with a red chile, was so milky and innocuous I feared I was ingesting straight coconut milk. Same with the green curry, swimming with fish balls and miniature green eggplants and a whiff of kaffir lime leaf, which nonetheless lacked both the chile heat and umami-intensifying fish sauce you'd expect in a proper bowl. 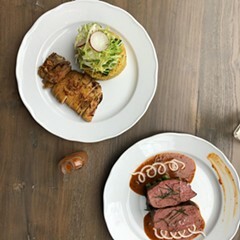 While there are some examples of culinary miscegenation (banh mi, shumai), the menu hews to a very familiar format. You have the same noodle dishes (pad thai, pad see ew, pad woon sen), the same salads (nam tok, som tam, yum woon sen), and the same appetizers (crab Rangoon, tod mun) you find all over the place, with occasional cosmetic flourishes to recall the fine-dining pedigree of the chef responsible. The long shadow of Sampanthavivat hovers over the proceedings (his framed awards for Arun's bedeck the walls). And for that reason it's impossible to not have high hopes for something like pad thai, one of the most egregiously abused dishes in the Ameri-Thai canon. And yet it arrives as a solid, unlovely gob of oversweetened noodles tossed with scraps of gnarled pork and missing the salty preserved turnip that would distinguish it from a thousand other slapdash efforts. Similarly, the breaded and fried snapper fillet and the wide rice noodles in the rad nah pla are overburdened with a preponderance of starchy, glossy, sweet sauce. 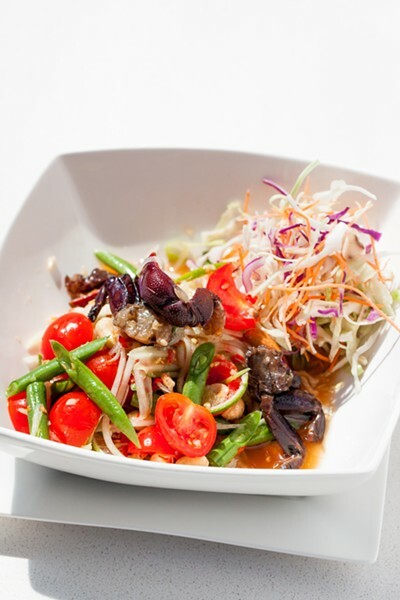 The beef salad nam tok, tossed with lime and toasted rice powder, is a reliable bellwether for the quality of the meat that in other dishes might be less obvious; here the tortured dry scraps stand out for what they are. If this level of execution were all the kitchen were capable of, it would perhaps be a less frustrating restaurant. But I had some very respectably prepared if familiar dishes there too. A snacky appetizer of breaded and fried pork croquettes amalgamated with toasted rice powder performs impressively as one of the less common items on the menu, and the minced fish cakes tod mun take on a similar textural role. 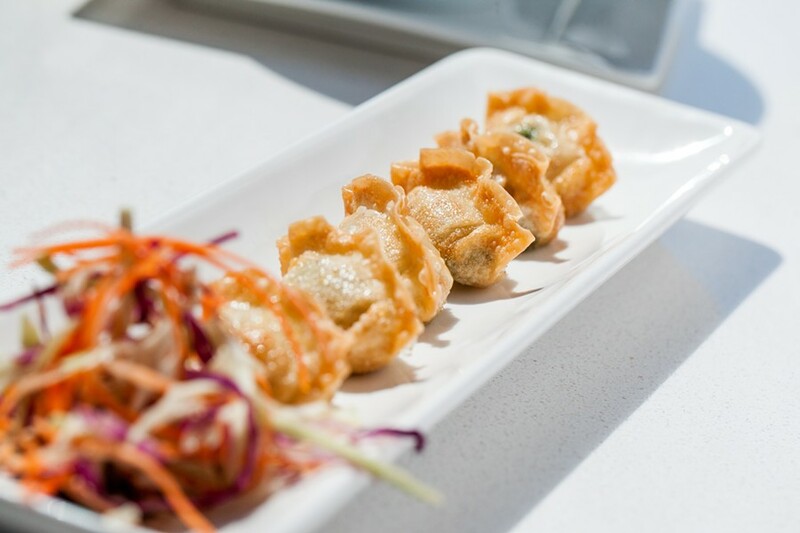 Miniaturized pot stickers are gobbled up in seconds, while shumai bulging with their porky fillings require more of an effort. 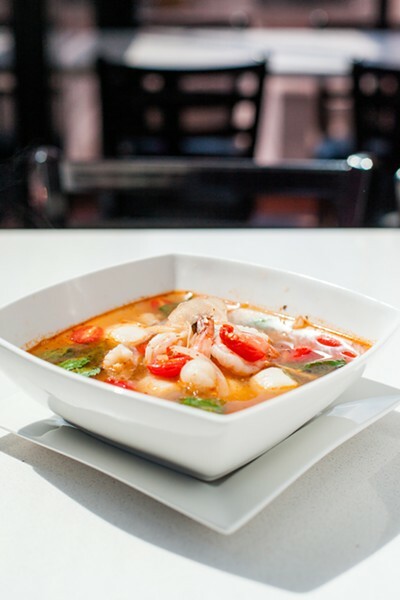 The clear seafood soup po tak, one of my favorites, is done remarkably well at ToTT, where it's a bracing hot-and-sour potion brimming with fat shrimp, fish balls, and sweet cherry tomatoes. 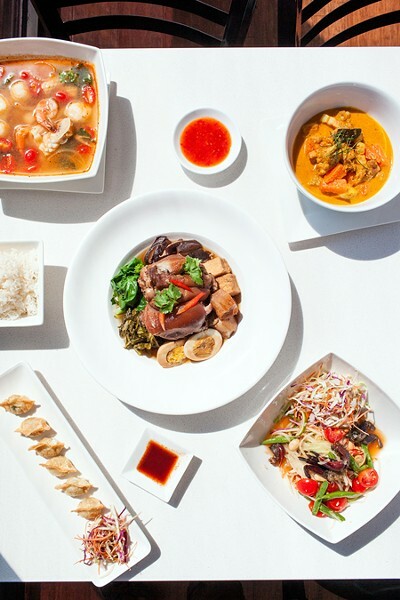 The ubiquitous papaya salad som tam—a standard bearer of balanced Thai flavor profiles that incorporates salty, sweet, and sour elements as well as chile heat—is offered with a choice of dried shrimp, salted crab, a squid-shrimp-scallop-mussel assortment, and (curiously) sashimi. 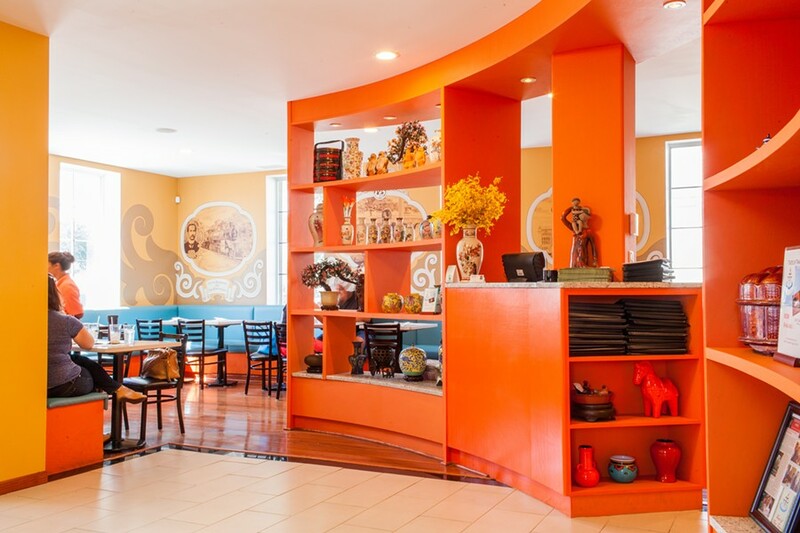 But rather than being on the regular menu, the most interesting offerings at Taste of Thai Town are on a special list that Sampanthavivat seems to be using to test his guests' temerity. The stewed pork hock dish khao kha mu might have been the most soulful thing I encountered; it features luscious pulled trotter meat, shiitake mushrooms, pickled cabbage, and Chinese broccoli, and is redolent with pickled garlic, star anise, cinnamon, and soy. A rich yellow turmeric-and-lemongrass-spiked pepper pork curry I'd never encountered before seems like exactly the kind of thing Sampanthavivat should be introducing his guests to more of.